Snoutly.com - Snoutly | Organic Nutritional Supplements for Dogs, 100% Human Grade and Organic | Nutrition the way Nature Intended it. SNOUTLY® - NUTRITION THE WAY NATURE INTENDED. 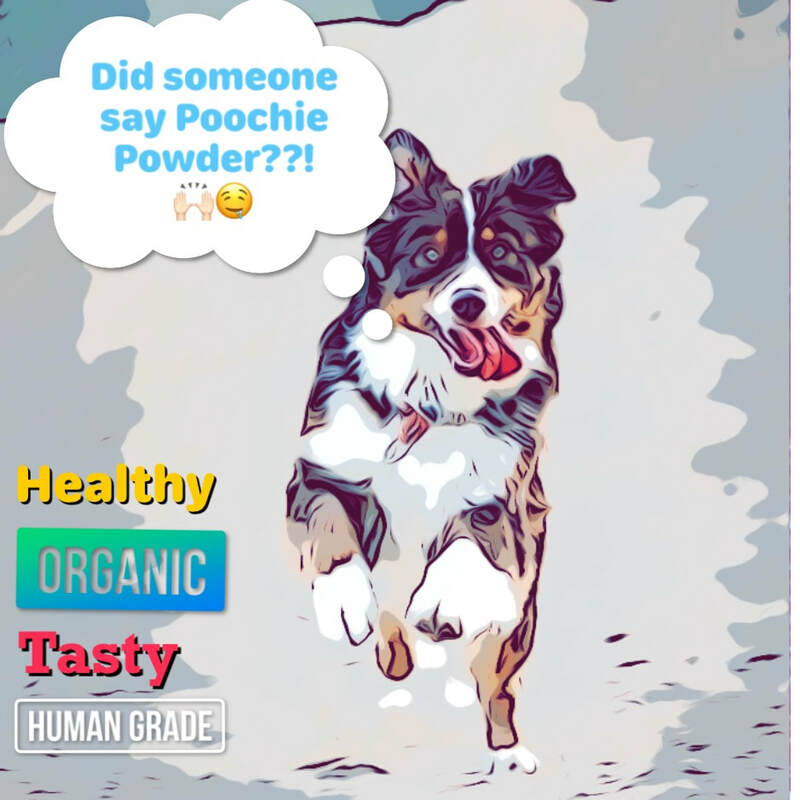 Our potent, nutrient dense and fiber filled organic superfood powder, is perfect for dog parents who want to fortify and help balance their dog's existing diet with whole food, plant-derived vitamins, minerals and antioxidants - delivered in a highly palatable formula. Poochie Powder® Daily Formula provides vital nutrition that your pup may not be getting from a meat centric, raw, kibble or homemade dog food diet alone. Our product is manufactured here in the U.S.A., in 100% human grade facilities, with human food grade ingredients sourced from trusted farmers and suppliers. Don't worry, your pet will love the taste of Poochie Powder®, it's been put to the test by the pickiest pooches around! If you don't believe it, tune in to our Instagram page for plenty of doggie demos @poochiepowder. When you buy a Certified Organic product, you can rest assured that it has been farmed and processed WITHOUT the use of synthetic agents or toxic additives like pesticides, antibiotics, chemical or sewer sludge fertilizers, artificial ingredients, dyes, industrial solvents, irradiation, or genetic engineering (GMO). Our ingredients are tested for pathogens and deleterious substances by a third party lab and also tested annually for heavy metals and pesticides to ensure they are within the legal limits as dictated by the relevant regulatory bodies. Our product is manufactured in an SQF Certified facility and is HACCP and FDA compliant. Plants contain vital phytonutrients, chlorophyll, minerals, prebiotics and enzymes your dog craves. Our limited ingredient supplement for dogs is 100% plant-based, containing freeze-dried, raw, plant-based superfood ingredients in an easily digestible, taste and smell friendly powder. At Snoutly, we are driven by quality. 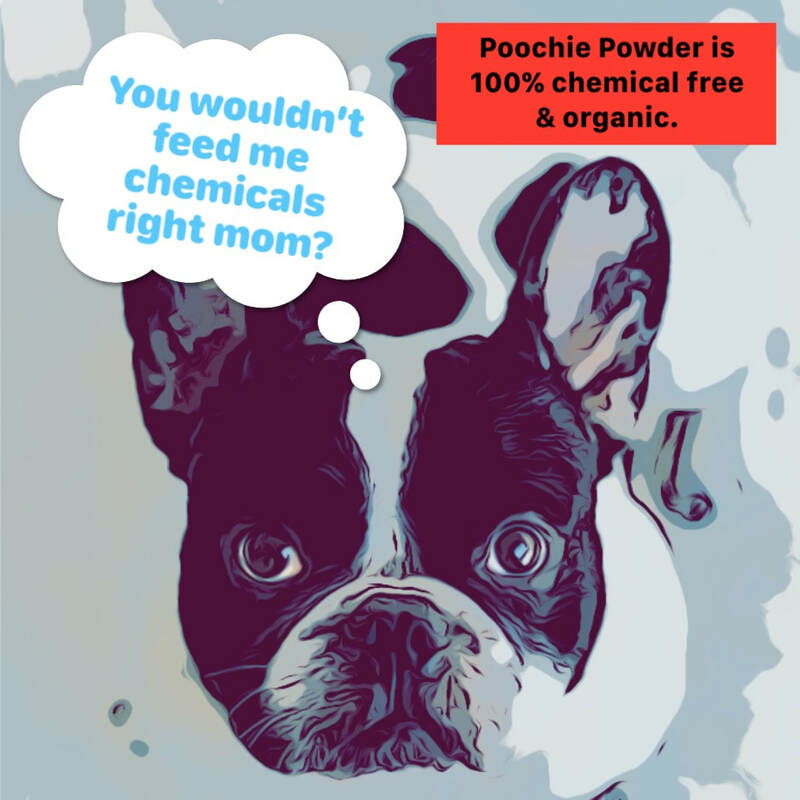 All of our Poochie Powder® production runs are manufactured in small batches, allowing us to control the quality standards and freshness of every bag. 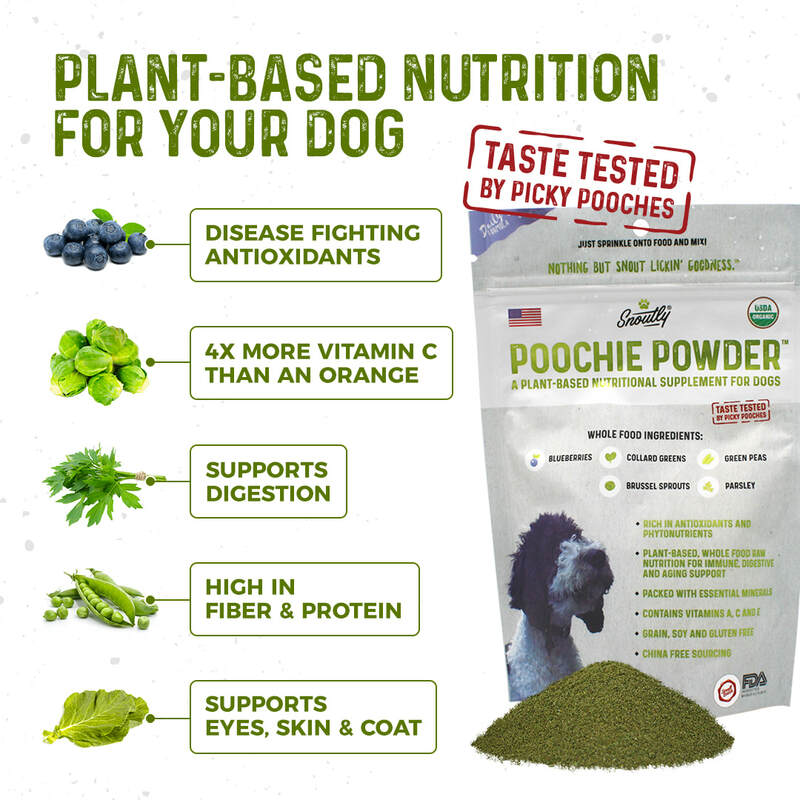 WHY DID YOU SELECT POOCHIE POWDER'S® 5 INGREDIENTS? ​CAN DOGS EAT VEGETABLES AND FRUIT? AREN'T THEY CARNIVORES? WHY IS CERTIFIED ORGANIC SO IMPORTANT? ​WHAT PROBLEM DOES POOCHIE POWDER® SOLVE FOR ME? 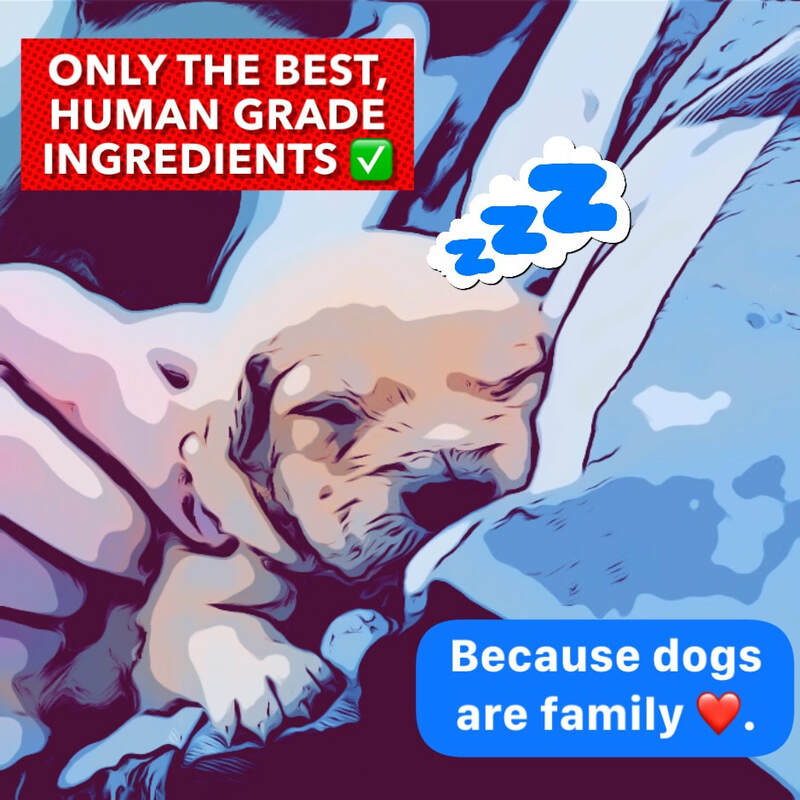 WHY SHOULD I ONLY BUY HUMAN FOOD GRADE QUALITY FOR MY DOG? 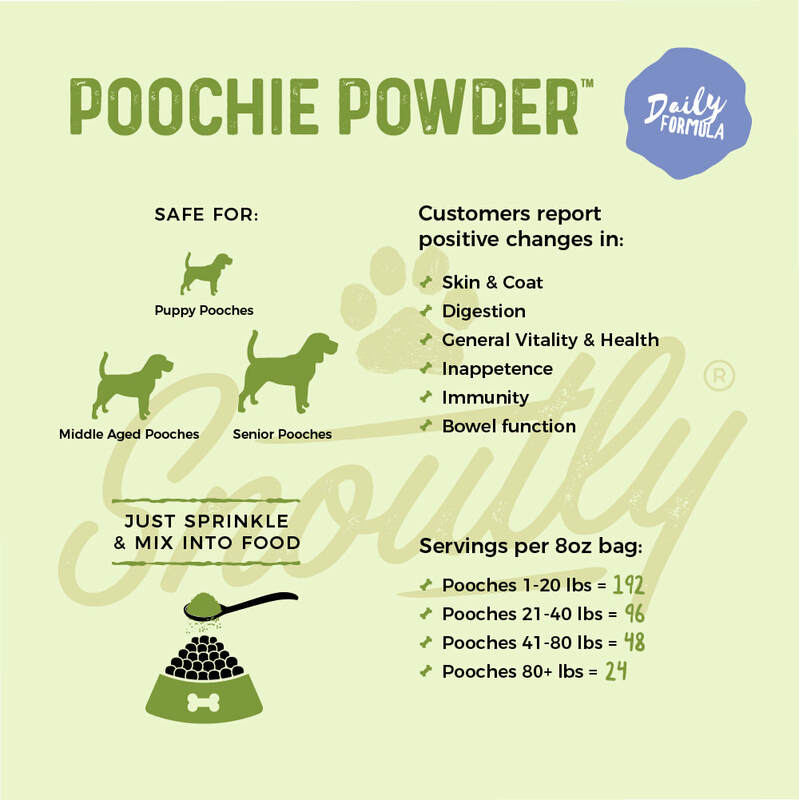 WHY IS POOCHIE POWDER® A POWDER AND NOT A PILL? ​INGREDIENTS - Organic Green Peas, Organic Wild Blueberries, Organic Parsley, Organic Collard Greens, Brussel Sprouts. ​For customer service matters, please send us an email at: customerservice@snoutly.com. ​​Now also available on Amazon ​and Amazon Prime. Open 7 days a week. Contact us.